In a rush? We also have an eBook on this subject. Just SCROLL DOWN to the bottom for our free pdf download! 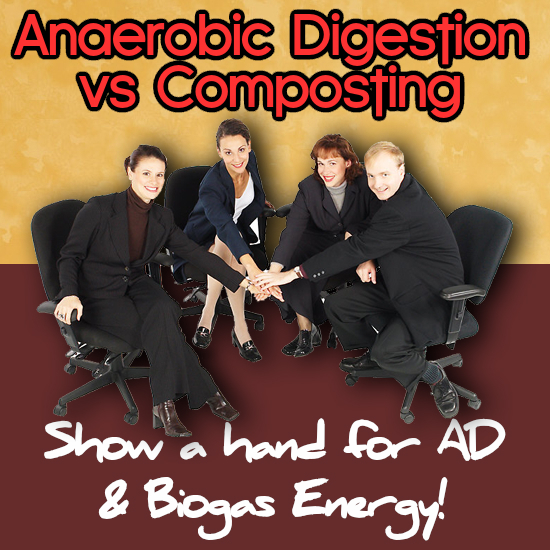 What are the advantages and disadvantages of anaerobic digestion vs composting is a question asked by a large number of people. Many of our readers who are familiar with composting, but who are thinking more widely about the subject of recycling organic waste and have just heard about Anaerobic Digestion want to know the anaerobic digestion pros and cons. First of all the two processes are very much the same. The crucial difference is that composting is the decomposition of organic matter in the presence of air (oxygen) and anaerobic digestion (AD) is the decomposition of organic matter, without air (and most importantly oxygen) present. 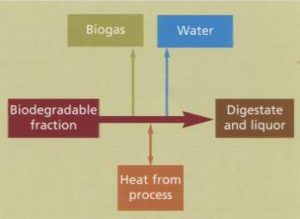 It is a net energy producing process which produces renewable energy in the form of biogas. It produces a liquid and a fibrous fertilizer. It sanitizes the feedstock/ waste which is put through it, as long as the temperature is held above a required temperature for a pre-defined time period. It reduces odour below unprocessed waste odour levels. It is much less likely to cause environmental pollution than spreading untreated organic waste on land. The effect of the fertilizer is longer lasting than for untreated organic waste. When carried out at a commercial scale on farms and at wastewater treatment works (WwTWs) it requires a high level of investment in large tanks and other process vessels. If run inefficiently AD can cause an odour nuisance. Lower initial capital investment needed to start of composting facility than is needed for an AD Plant. A slightly lower level of training is needed to run a composting plant the is required for an AD Plant. It produces a solid output/ fertilizer only. For some this will be an advantage, but in general this digestate product is a neutral factor, neither positive or negative for composting. It has the same advantages as for AD (items 3 to 6 inclusive) over spreading untreated organic waste material on land. Like anaerobic digestion, it is necessary to pasteurize the composted material to ensure that all infectious agents have been effectively removed. This requires very good operating practice and detailed monitoring to demonstrate to regulating bodies. This is the biggest disadvantage! Composting requires the input of quite large energy inputs to aerate and turn the compost piles. By comparison anaerobic digestion wins hands-down for “greenness”, and it makes no contribution to reducing the carbon footprints of businesses that use the composting process. By comparison AD Plants can assist businesses by reducing their carbon footprint. Like AD, if run inefficiently Composting can cause an odour nuisance. Yes, one is with and the other without oxygen, and both divert waste from the landfill—but in terms of the end products, what is the advantage of anaerobic digestion? Simply put, does society face a shortage of compost or renewable energy? In San Francisco, the green compost bins are ubiquitous. Even the food trucks are required to place bins alongside their trucks for compost, recyclables, and trash. Result: the city is diverting an enormous amount of trash from the landfill to help meet its zero-waste goal and producing lots of compost in the process – a process which also produces a lot of carbon dioxide, “the primary greenhouse gas emitted through human activities,” according to the EPA. There are advantages to both anaerobic digestion and composting, and certainly applying either before green garden waste, or other organic waste is spread on the land, is better than not processing these materials at all. On balance the preferred process is anaerobic digestion. The primary reason that anaerobic digestion is considered more sustainable than composting is that composting requires an energy input to carry out the process. The energy is used in the power needed to turn the compost piles during composting. The fact that anaerobic digestion produces biogas is a renewable energy source which burns cleanly, and that biogas plants make more energy than they consume to operate, is generally the factor that makes anaerobic digestion the best most sustainable option. We hope that you found this article useful. If so, and you have a moment to do this. We would greatly appreciate your comments. 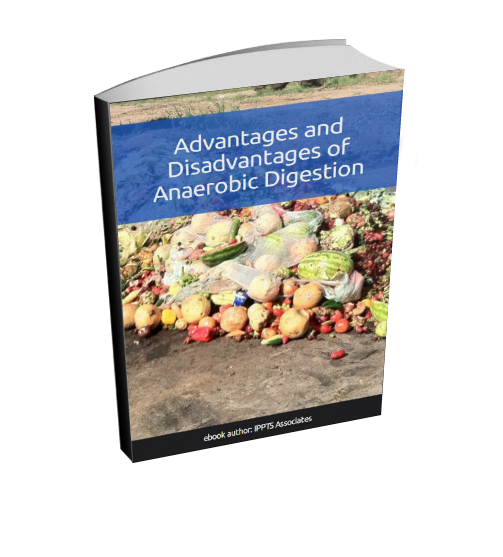 Download Our Free eBook on the Advantages and Disadvantages of Anaerobic Digestion here! Keep it on your computer for easy reference. I liked your site a lot. I’m taking an online course on Water Quality Technology from the UW-Moraine Park and I found this very useful in helping me write a paper on alternate methods of sludge stabilization. Thanks. Thanks for your feedback. It is appreciated, and it is good to hear that you found some useful information for your paper. why aerobic degradation is faster than anaerobic degradation???????????? I think that the normally given answer the AD experts will give you is that the methanogenic archaea that do the anaerobic degradation, are a lot slower growing (metabolising) than their aerobic equivalents. I hope that helps you. The reason that aerobic degradation is faster than anaerobic degradation is that the anaerobic organisms (methanogens) that do the degrading in anaerobic systems are slow growing at normal ambient (atmospheric) temperatures. They grow faster at higher temperatures. If you look on the web you will see that in hot tropical climates it is much more common to see small domestic biogas plants. Those un-insulated tansk don’t work so well in cooler climates. Thank you for posting this great article. I’m a long time reader however I’ve never actually left a comment. Your writing is very well received by me. At first my view was to say that anaerobic digestion was not preferable to composting, now I see that you are telling us the opposite. The fertiliser is a much needed product for farmers I am sure. The Advantages of Anaerobic Digestion are many. Thanks to Brazilian-German Project on energy from Biogas – PROBIOGAS (DKTI). In May 2016, a biogas project based on agricultural residues with a capacity of about 21 MW won an energy auction for the first time. The energy will be priced at EUR 70/MWh, and it will start producing electricity from 2021. My name is Aly and I would like to know if you would have any interest to have your website here at anaerobic-digestion.com promoted as a resource on our blog alychidesigns.com ? Hi. Thank you for the informative writing and article. 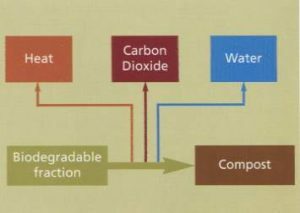 Some people are using the heat generated from composting to heat water/interior spaces, so perhaps that could be added to the advances of composting. 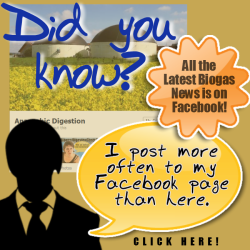 Would like to know if you would have any interest to have your website here at anaerobic-digestion.com promoted as a resource on our blog. If so mail me to the email I just used for this post. We are in the midst of updating our broken link resources to include current and up to date resources for our readers. Our resource links are manually approved. Baz – Yes. I mailed you.